One of the curious features of the house I bought last year was a really old looking locked safe in the garage (made by the Hermann Safe Company in San Francisco). The previous owner had the combination somewhere, but had never opened it. After closing on the house, I attempted to get the combination from the previous owner. Maybe he misplaced it or maybe he was reluctant to give it to me, kicking himself for having not opened it, but it took me about a year of bugging him to finally get the combination. We opened the safe with high expectations, kind of like Geraldo Rivera opening Al Capone's Vault, but of course there was nothing of value in it. So what we are left with, is a very curious San Francisco artifact! The safe itself is very interesting, perhaps 3' tall and very heavy. The painting on the outside appears to have been done by hand. The inside has some cabinetry built in, and what looks like a carpet on the floor of the safe (which is now deteriorating over time). The house was built in 1941, and from the light research I did on the Hermann Safe Co., the safe was probably made in the 1920's or 1930's. I hope to find out more about it in time (no plans to get rid of it). 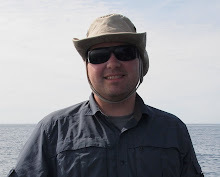 Although, if anyone has an indication on it's worth or how rare it may be - I'd be interested in learning. In the meantime, I did find out that the Hermann Safe Company is no longer in business; having sold out to a company named "The SafeMart" - and they supposedly no longer make safes. There is a listing for the "Hermann Associates Inc. The Safe Mart" in San Francisco I'd like to look into further. 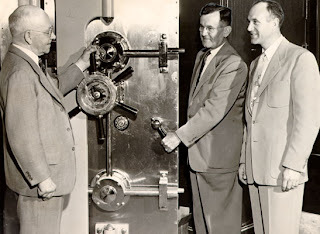 I also found this photo of Carl Haas, vice president of the Hermann Safe Company, standing with John R. Hermann senior and junior from 1952 - as well as Hermann Safe Company workers delivering a vault to the American Trust Company in 1958. Here's a photo of a beautiful safe door from the Old Mint on 5th & Mission Streets. I love how they took the time back in those days to decorate things by hand. 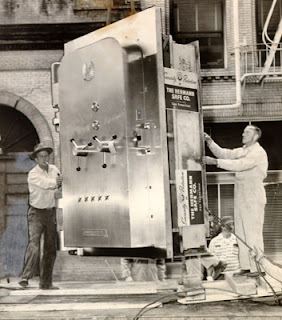 From what I have researched, Hermann Safes dominated the west coast from the early 1900's until about the 1960's when the Hermann Safe Company sold to Herring-Hall Marvin. and just a little correction, since Hermann Safe Company no longer produced the safes, they started doing business as The Safe Mart. 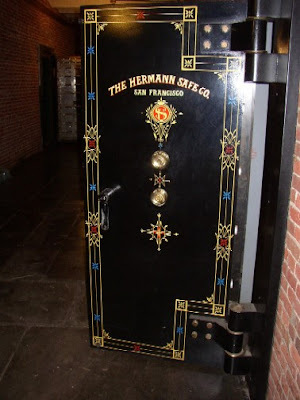 I live in San Francisco and have seen plenty of Herman safes around, as well as been to a few buildings with Hermann vaults. So I don't think they are that rare, but you might want to research antique pages to find out. That safe is loosely worth around $8500 or quite possibly more. The selling point with yours is the relatively small size, which allows it to be moved through some common doorways (unlike my huge 9,600 lb triple door Hermann beast, which requires a crane and portable hydraulics). The paint and plating on the exterior is very good. The nickel plated lead caps are all there too. You have a really desirable safe! Find out who or what RIALTO is all about if you don't already know by now. Someone apparently customized the safe by adding that name. There is a historical society in SF that might be able to help. Also consider looking at Cypress Lawn for clues (in Colma). A female relative of the Hermann Safe Co. is still working in the business in SF. She might be able to help shed light on it. Just curious: Does or did your safe have a timer affixed to the door? What patent dates are on the lock? Thanks Andy. Maybe the safe has something to do with the Rialto Buuilding in San Francisco, which was added to the National Register of Historic Places in Jan 2011.